Addis Ababa 28 January 2018 - The Assembly of Heads of State and Government of the African Union (AU) meeting at their 30th Ordinary Session at the AU Headquarters in Addis Ababa, Ethiopia, elected on 28th January 2018 a new bureau to pilote the activities of the Union for the year 2018. The newly elected Chair of the African Union is HE. Paul Kagame, President of the Republic of Rwanda. He is taking over from HE. Alpha Conde , President of the Republic of Guinea who has been chairing the Union for the past year 2017. “I promise to do this with you and do the best job I can. Obviously, I will need your full support” he said , before acknowledging the high experience of his predessesor, saying “President Alpha Condé is a professor, a teacher, and I can safely say that I have learned from him. I have also seen his very big heart for Africa. Congratulations Mr President” . He called on his peers to join him in paying tribute to President Conde’s impeccable service to our organization. “ I have been lucky to work with his predecessor President Idriss Deby, and even luckier, to work with both of them. I want to assure you that I had a lot of wisdom flowing from them”, noted the newly elected Chair of the Union. President Kagame underlined that, Africa’s defining challenge is to create a pathway to prosperity for our people, especially the young people. He said, elsewhere, this has been achieved through industrialisation. But the growth trajectory that transformed Asia is not necessarily any longer a viable option for Africa, simply because we waited too long to act. He added that, technology has evolved so rapidly in recent years, that Africa’s window to follow that strategy is narrowing much more rapidly than previously understood. “We are running out of time, and we must act now to save Africa from permanent deprivation” incoming Chair of the Union. According to the new President of the Union, Scale is essential. We must create a single continental market, integrate our infrastructure, and infuse our economies with technology. No country or region can manage on its own. We have to be functional, and we have to stay together. The financial and institutional reform of the African Union derives all of its urgency from these realities. Fortunately, Africa has assets and strengths to build on, starting with this organisation, and its tangible commitment to unity. This, he said, is an advantage, which no other region of the world possesses, in such abundance. “Unity must be our starting point, as we do the necessary work of re-defining our plans and ambitions, in continental terms….These changes need to happen. There is no country on our continent that does not want to be part of a more assertive and visible Africa”. 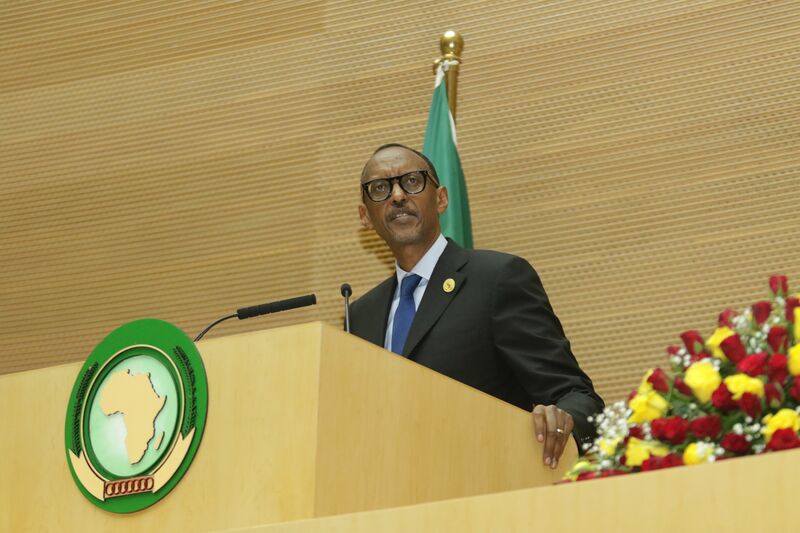 President Kagame further said the programmes, policies, and priorities of the African Union contain the right tools for the job. “I wish to pay tribute to previous leaders of the African Union, and to former Heads of State, for paving the way forward”. He added that, there is tremendous value in the African Union’s flagship initiatives, such as Agenda 2063. “Because of their foresight, we are in a position to adopt three historic agreements, that are of the highest importance for building Africa’s wealth, from within. Today, we will launch the Single African Air Transport Market. This is a major step forward for transportation; We are nearly ready to adopt the Continental Free Trade Area. It really needs to be done this year; Freedom of movement for people in Africa is equally important, and it is achievable in 2018” emphacised the new Chair of the Union. He added that, “by committing to break down these barriers, we will send a tremendous signal in Africa and beyond, that it is no longer business as usual…Our people deserve a brighter future. Their sacrifice and hard work should be rewarded with better lives for families and communities”. “We are thankful to the Heads of State, who champion important themes and priorities of the Union at every Summit. I wish to commend the efforts of the African Union’s professional staff, which often goes unheralded.” President Kagame was optimistic that soon enough, Union will also have the funds to support the African prosperity agenda. He annoubced that, the levy on eligible imports is being implemented, the Golden Rules were recently approved by the Finance Ministers, and we have a more credible budget process in place. The outgoing President of the Union, Alpha Conde thanked the new AU Chair and promised to give him the necessary support to enable him manage the affairs of the Union successfully during his mandate.